You are invited to join us for worship at 10:30 on Sunday morning. Please come in quietly and sit wherever you like. If you have brought children, they may wish to join our First Day School program in another part of the building. Ask someone to show you where they will be gathering. Our worship time together is in the traditional, unprogrammed manner of Friends (Quakers). Silently “waiting upon the Holy Spirit,” we gather with open hearts and expectant minds. Quakerism is a group of insights, attitudes and practices that together form a way of life, rather than a creed. It rests on a conviction that, by searching our inmost hearts, we can have direct communion with God. All share responsibility for the ministry of silence. Do not be overly concerned with distracting thoughts; they happen to all of us. Gently put them aside as you approach your still center, and try to be quiet in body, mind and soul. As worship progresses and deepens in the silence, the presence of the Spirit may be made known, both to individuals and to the gathered worshipers. Friends may worship entirely without words, but usually there will be some brief spoken messages. Anyone may feel called to speak, man, woman or child, member or first-time visitor. After each message, we encourage some silence so that the message may be absorbed. Friends look for the underlying truth, regardless of the words chosen to express it. Toward the end of the hour, the children join us for worship. One Friend, called the greeter, signals the conclusion of the meeting by shaking hands with others nearby. He or she then invites all to introduce themselves and share any personal news or make announcements. The children share what they have done in their program. First-time visitors are invited to tell a little about themselves. There is generally a coffee hour after the meeting, and we invite you to stay. 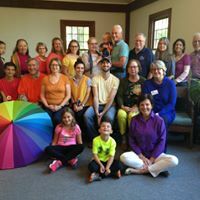 If you have questions about Quakers or any meeting activities, the greeter will be glad to answer them or int roduce you to someone who can give you more information.